Jo Pavey, the inspirational European 10,000m champion, is to make an emotional return to Glasgow for the 2015 Bank of Scotland Great Scottish Run as she prepares to challenge for a fifth Olympic appearance. The 41-year-old Exeter Harrier has decided to include the popular half marathon, which takes place on Sunday 4 October, in her autumn racing schedule as she maps a potential path towards next summer's Olympic Games in Rio de Janeiro. It will be Pavey's first race on Scottish soil and back in Glasgow since she captured the imagination of the British sporting public by battling to a Commonwealth Games 5,000m bronze medal as a fortysomething mother of two on 2 August last year. Just ten days after charging up the home straight at Hampden Park to secure a podium place at Glasgow 2014 behind Kenyans Mercy Cherono and Janet Kisa, the supermum from the English west country hit the headlines again as she stormed to 10,000m gold at the European Championships in Zurich's Letzigrund Stadium. “It means a lot to me to be coming back to Glasgow for the Bank of Scotland Great Scottish Run,” said Pavey, who will be back in a Great Britain vest this Saturday (6 June), competing in the European Cup 10,000m race in Chia-Pula, Sardinia. “I really wanted to run last year but it was not possible because of injury. 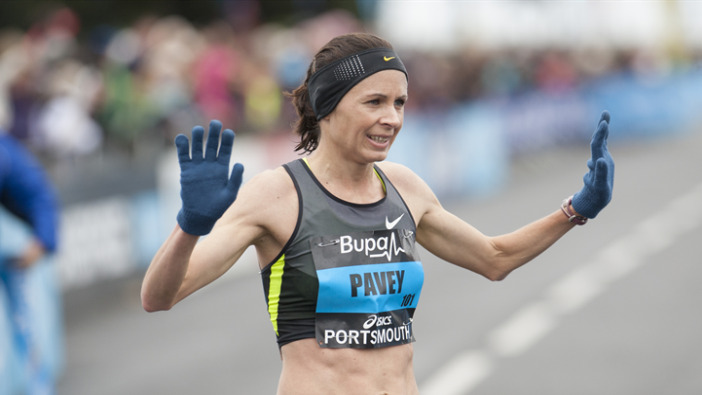 Pavey has not run a half-marathon since September 2012, when she finished fifth in the Great North Run on Tyneside. That outing over the 13.1 mile distance came just after a month after she finished seventh in both the 5,000m and 10,000m finals at London 2012. Pavey made her Olympic debut in Sydney in 2000, finishing 12th in the 5,000m final. She also ran in Athens in 2004, placing fifth in the 5,000m and in Beijing in 2008, finishing 12th in the 10,000m. “I'm getting older and older but I'm still enjoying it and I've still got goals I want to achieve,” said Pavey. “My main goal, going forward, is to try and qualify for Rio and I'm quite focused on that. “I'm not complacent about it. There's so much talent coming through in Britain and, as I say, I'm getting older and older. But I still just want to give that a go - and that's my main thing on my mind at the moment. You can follow the event on Twitter @GreatScotRun using #greatscottishrun or on Facebook by searching Bank of Scotland Great Scottish Run.